Plot: Product Description: In this psychological horror film, Zeljko Ivanek stars as John Doe #83, a patient admitted to a psychiatric hospital after a suicide attempt. When Dr. Gail Farmer, the psychiatrist assigned to his case, begins experiencing vivid hallucinations, she suspects that she may be telepathically connected to her new patient, envisioning what he is experiencing in real time. First off I've always felt that this was an underappreciated and often overlooked little supernatural thriller that leaves a lasting impression upon you. I was truly excited to learn that Olive Films was finally giving this a new outlet on a wonderful Blu-ray format. A mysterious man try's to kill himself by drowning. He is admitted to a mental hospital. Dr. Gail a psychiatrist try's to figure out what is the reality taking place. Soon the spiraling, twisted web of nightmarish horror over shadows every waking moment. This will always be one of my favorite films due to the fact it is the introduction to the wonderful actor, Zeljko Ivanek. A true star, very definition of actor. He is so young in this part as the mysterious Sender. This was his first feature film. But in reality the Introducing title is not correct. He had acted in 2 others films in the same year as The Sender came out. These two films, 82's The Soldier & 82's Tex, came out months earlier. Although The Sender is his first major starring role, the other 2 films where just small insignificant parts. He did a truly fantastic job in The Sender, very creepy, very twisted, and very unique. This also stars the beautiful and wonderful Kathryn Harrold as the main female, Dr. Gail. Always a treat to see. This also stars one of my favorite actresses Shirley Knight as The Senders mother. Knight is one of the most gifted actresses to ever grace cinema both big and small. She played in one of my favorite films 1980's Playing for Time, which might I add, can also be bought on Blu-Ray by Olive Films. I think what I like about this movie the most is the very weird, odd and strange reality. It almost plays out like a nightmare. A darkened fever dream of illusion. This was directed by Roger Christian. This was his first feature length film. Christian has had pretty much all misses in his film making. The Sender is about his only real stand out film. Roger Christian directed one of the worst films in cinema history, 2000's god awful Battlefield Earth. The Sender is his crowning achievement in his career. 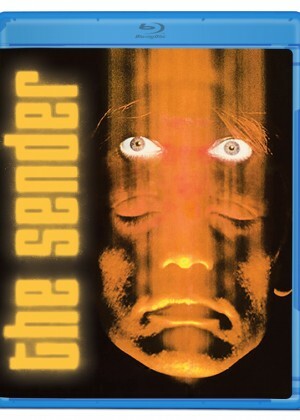 It does have its flaws, and some mistakes on screen, but The Sender is what I consider above and beyond a lot of the telepathic horror films of the 80’s. I think The Sender is more unique in the mystery of the truth, and also in its capturing of a living nightmare. Another reality that makes this film stand out is the sound effects, visual effects, noises, and music, truly create a haunting experience throughout this nightmarish like film. Olive Films did an amazing job in sound quality. The audio is ear candy. Crisp, loud and stunningly brilliant. The imagery also has never looked any better. Compared to the VHS or past DVD copies, this Blu-Ray is dynamic. Olive Films brought out another fantastic film on a great Blu-ray to experience. The Sender is strange, different, and an odd little film that has its own little world. Olive Films did a fantastic job in picking this film for one of their releases. Awesome audio, never has sounded any better. For being its first time on Blu-ray it looks beautiful. A great trippy telepathic supernatural horror thriller, to experience in a whole new light.